Les Cordes a New Twist on a Rope Light. 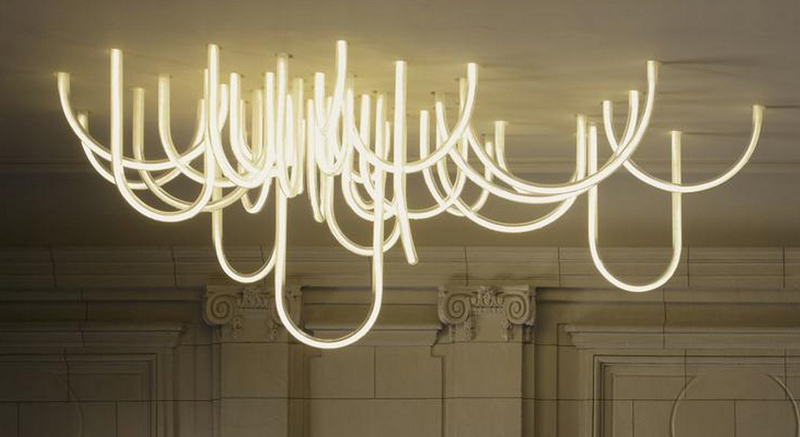 Mathieu Lehanneur created a new twist on the rope light for the reopening of the Museum of Decorative Arts, pottery and fashion in the castle Borely Marseille. The lamp is constructed from borosilicate glass that is kiln bent frosted and then fitted with LED’s and a control system. It’s an absolutely wonderful take on both a chandelier and the rope light with all those overlapping sweeping curved surfaces. The video below shows the production process that went into making this one of a kind light for the school. What a really impressive design and fabrication process.